Being around horses is a wonderful experience, owning horses is even more rewarding. 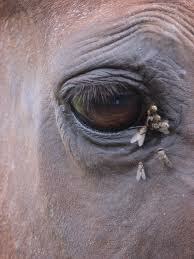 But horses attract ﬂies, actually horse manure attracts ﬂies. Not only are ﬂies annoying but they transmit bacteria and germs that can be unhealthy for you, your horse and your family. Fly Predators kill ﬂies before the ﬂies hatch and lay eggs so they are a wonderful method to reduce ﬂy problems in a safe, non chemical way. When starting in the spring when the temperature is warm enough for ﬂies and re releasing thru the season you can expect to see a 70% reduction in the number of ﬂies. Fly Predator is a general term for a few spices of beneﬁcial insects that attack ﬂy larvae, in fact they not predators they are parasites because thy kill the ﬂy internally. Some of the other names they are sold by are Fly Parasites and Fly Eliminators. Of these spices Muscidifurax raptorellus, Spalangia cameroni and Muscidifurax zaraptor do the best job for ﬂy control. When purchasing ask for these spices by name. They are tiny, will not sting or bite and are nocturnal so they are not active when you are. Fly Predators are sent thru the mail in their pupa (egg) stage mixed with wood shavings as a ﬁller, a day or two after arriving when they start to hatch you will see them crawling on the inside of the bag, look closely though as they are quite small. Take the bag out to the pasture as sprinkle the pupa/shaving mix near fresh manure as that is where the ﬂies are breeding and laying eggs. Two days after they hatch the female ﬂy predators search out the ﬂy pupa, inside the pupa on average are 130 ﬂy eggs. The female Fly Predator locates the pupa, bores a hole and deposits her eggs inside, over the next 3 weeks the Fly Predators are feeding on and killing the ﬂies, then the Predators hatch and start the cycle again. Unfortunately while the female ﬂy lays an average of 130 eggs a day the female Fly Predator will lay between 2 and 9 a day. Re releases need to be made thru the ﬂy season for best results, companies selling Fly Predators will have a graph showing how much and how often is recommended. Make sure you are releasing enough Fly Predators. If you have 20 horses you will need more than your neighbor with 2 horses. When ordering check how many are in a pack, checking on the internet one company has a full until with 15,000 pupa and others only 10,000 yet they both sell for the same cost. Some companies do not show amounts at all. Also make sure they count the pupa, some companies count the parasites to make it look like they are sending 10 times as much as their competitors.